Centre of the Picture Gives an Idea of the Size of the Monuments. On the Right is the 35ft High William Gavin Monument. 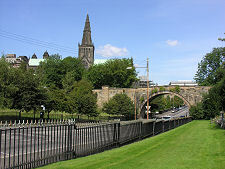 Just to the east of Glasgow Cathedral, beyond the course of the (now culverted) Molindinar Burn stands a rocky hill. In 1651 this was purchased by Glasgow's Merchants' House (a powerful grouping of the city's merchants) and, after being planted with fir trees, became known as Fir Park. 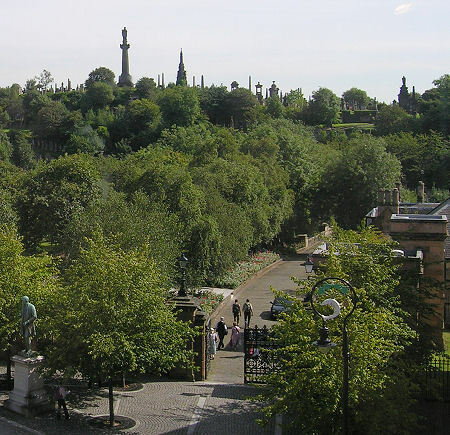 In 1831 the Merchants' House agreed that the land would be more profitably used as Glasgow's version of the world-famous Père Lachaise Cemetery in Paris. 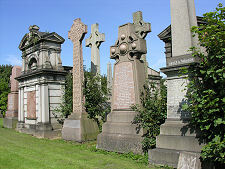 Fir Park therefore became the Glasgow Necropolis. Over the years since then, some 50,000 people have been buried at the Necropolis, in around 3,500 tombs that extend anything up to 14 feet below the ground and which, on the rocky upper parts of the Necropolis, had to be excavated with the aid of blasting powder. 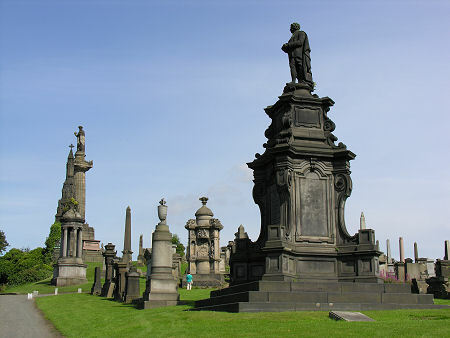 The monuments that mark these tombs, especially in the upper parts of the Necropolis, are a tribute to the disposable wealth available - at least to some - in Victorian Glasgow, many being built on a vast scale. The result is an outdoor museum of the work of most of the leading Scottish architects of the day, as monuments compete for attention with their intricate detail and in many cases, sheer size. Extensions to the area of the Necropolis in the latter half of the 1800s led to it reaching an overall size of 37 acres or 15 hectares (rather under a third of the size of the Père Lachaise Cemetery). 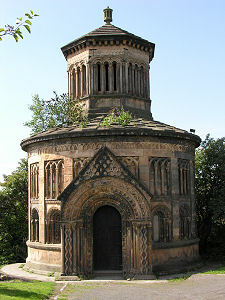 In 1966 the Merchants' House gave the Necropolis to Glasgow City Council. 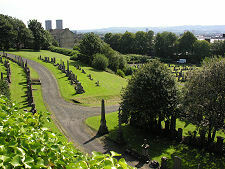 The council cleared it of many grave surrounds and ornamental benches that both cluttered the Necropolis and made maintenance and upkeep more difficult. 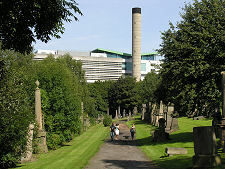 Today the Necropolis is partrolled by Park Rangers, guided tours are available (see the Visitor Information section on this page), and Glasgow Necropolis is high on the list of "must visit" attractions in central Glasgow, both as an object of interest in its own right, and as a viewpoint over much of the rest of the city: the views of Glasgow Cathedral are especially good from here. The hilly and heavily vegetated landscape, and the city centre location, must make maintenance and upkeep of the Necropolis quite a challenge: and it is true that some monuments sprout vegetation; a few bear graffiti; and some have either collapsed or sport "Danger, Keep Out" signs. But despite this, the overall feel of the Necropolis is intriguing and, though it may sound odd to say it, welcoming. You have to remember that the monuments placed here were intended to be looked at and appreciated: it was always intended that visitors should come to marvel at the architectural splendour of the monuments (and the wealth of those who paid for them). Glasgow Necropolis was always intended to be a multi-denominational burial ground, and one of its oddities is that while some of its monuments relate to multiple burials, others are in memory of people who are not buried here at all. 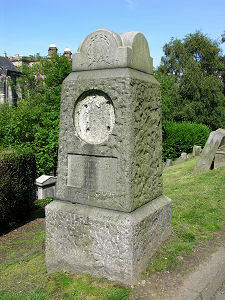 The most striking example of the latter category is the tallest monument in the Necropolis, to John Knox. This was actually placed here in 1825, when the area was still a park. A massive column is topped off with a 12ft high statue of John Knox himself. To modern eyes the location seems a little ironic: Knox is facing west, overlooking Glasgow Cathedral, one of the few medieval churches in Scotland not destroyed during the Reformation in which he played such a leading role. 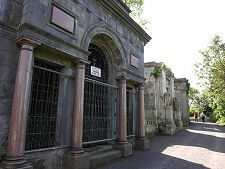 The main entrance to the Necropolis is via ornate gates bearing the motif of the Merchants' House to the south of Glasgow Cathedral. 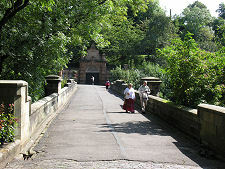 From here a drive leads past the Cemetery Lodge and over the Bridge of Sighs. At the far end of the bridge with the hillside of the Necropolis rising steeply above, you are faced by a large sweeping stone facade containing an arch and doorway. This is a relic of a very different Necropolis that almost developed here. In the early 1800s body-snatchers or "resurrectionists", who stole freshly-buried corpses for sale to medical schools, were a serious problem in Scotland. The Necropolis was originally intended to comprise extensive catacombs under the hill. These would have been entered only via this one easily-guarded gateway and would have protected the bodies within. But the Anatomy Act of 1832 opened up a legitimate supply of corpses for medical study and research and body-snatching simply ceased. The Necropolis therefore developed into the cemetery you see today. Once within the Necropolis a network of paths can initially seem confusing. For those finding their own way around, there are excellent guides on sale in the bookshop of the nearby St Mungo Museum of Religious Life and Art. 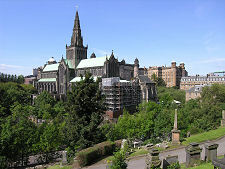 Alternatively, simply keep taking the uphill option at any path junctions and you will soon find yourself in the hugely impressive upper part of the Necropolis and wonder at the evidence of conspicuous wealth on view. While John Knox has the earliest and tallest monument, others are not far behind in terms of height. 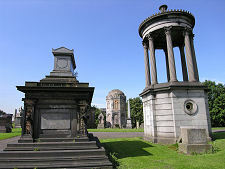 For us, one of the most striking is the mausoleum built for Major Archibald Douglas Monteath. This is a highly ornate 30ft diameter structure modelled on the Church of St Sepulchure in Cambridge. The level of detail is amazing, with every window-arch on the lower level bearing a different pattern. 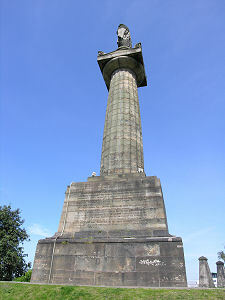 Perhaps the most imposing monument in terms of its combined location, bulk, height and detail is the 35ft high William Gavin Monument shown in the header image. 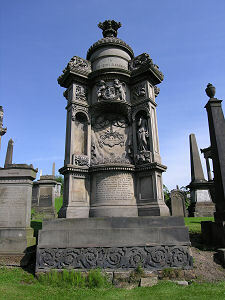 Others are much more modest in scale, like the memorial erected by public subscription to William Miller, author of the nursery rhyme "Wee Willie Winkie".